The castle now houses The Bader International Study Centre, Queen’s University (Canada) but the gardens and grounds are occasionally open to the public. N.B. Be warned – the post code will mislead sat nav users. Three miles from Pevensey. A noble castellated mansion, built entirely of red brick with stone dressings, in the best style of the fifteenth century. It forms a link between the fortified castle of the Middle Ages and a palatial manor-house, such as was adopted by the rich nobles in later times of increased security, and until its demolition in 1777 it was counted as the most perfect and regular castellated house in England. Now, little remains except the outer walls and towers—a mere shell ; but from these ruins, with the aid of plans and drawings existing of the perfect structure, we can realise what this was. It stands on low ground at the head of the Pevensey Level of marsh land, where probably in early times the sea flowed up to the edge of the forest lands of Anderida that covered all this southern district of Sussex. The name of the manor was originally Herst or Hurst, which signifies a wooded tract, and soon after the Conquest this manor of Hurst became the property of a noble family, whose head took the appellation of William de Herst, to which (temp. Henry II.) was added the name of the Norman territory from which they came, namely Monceux—probably the place of that name near Bayeux ; this name was also given to another property with which the family was connected, Compton Monceux, in Hants. On failure of heirs male in this family (cir. 1320), the heiress, Maud, carried the manor by marriage to Sir John de Fiennes, the descendant of an ancient Norman race—a member of which had come over with Duke William—and Hurstmonceux, about the middle of the reign of Edward II., became their chief residence : their house may have been on the same site as the later mansion. The grandson of this Sir John, Sir William Fiennes, had two sons, Roger and James, the latter being afterwards made Lord Saye and Sele and Lord Treasurer of England, who was murdered by the mob of Jack Cade. The elder was a bold soldier of high reputation, who fought at Agincourt, and became Treasurer of the Household to Henry VI. He it was who built the fortress in question in 1440. His son, Sir Richard, married the daughter of Thomas, Lord Dacre, of the South (see NAWORTH, CUMBERLAND), and the estates passed into the Dacre family, with whom they continued until 37 Elizabeth, when, by the marriage of an heiress, they came into the possession of a Kentish family of the name of Leonard, or Leonard, the heir succeeding to the title of twelfth Lord Dacre. His grandson, fifteenth baron, was created, in 1674, Earl of Sussex, and was a Lord of the Bedchamber to Charles II., whose daughter, by the Duchess of Cleveland, he married. He ruined himself by extravagance, and was forced, a few years before his death, which happened in 1715, to dispose of the Hurstmonceux estates to George Naylor, for £38,215. This gentleman, dying s.p., left the property to his sister, the wife of a cousin, Dr. Hare, Bishop of Chichester, from whom it came, in a condition of neglect, to his second son, the Rev. Robert Hare, by whose “Gothic barbarity,” under the baneful advice of the architect, Samuel Wyatt, this princely abode was ruthlessly stripped and destroyed in order to build a brand-new house called Hurstmonceux Place, the ancient tapestries, and furniture, and the carvings being sold by auction. The property has been sold three times since : first, to Thomas Reed Kemp, in 1807 ; next, to the trustees of the late John Gillow, and in 1846 it was purchased by the late Mr. Herbert B. Curteis, M.P., whose son, Mr. Herbert M. Curteis, formerly M.P. for Rye, is the present owner. Although little remains but the outer walls of Hurstmonceux Castle, yet the perfection of the brickwork is such that this material still stands in thorough preservation. The mansion, which was protected by a wide moat and a drawbridge that was in existence when Horace Walpole visited the place in 1752, was built in a square of four strongly fortified walls, enclosing four inner courts, round which were grouped, on two floors, all the apartments necessary for the establishment of a great noble. 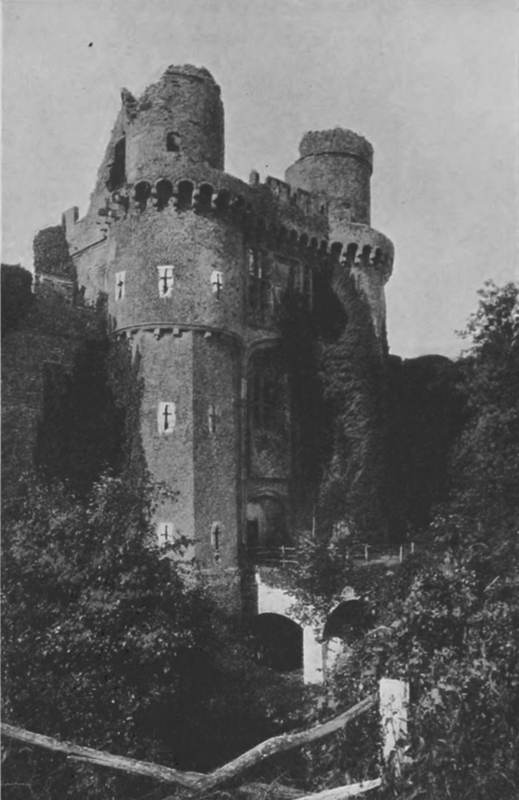 On the S. front, a facade of magnificent aspect, is the great entrance, placed between two lofty towers, 84 feet in height, and fortified by a heavy machicoulis and two turrets above. At each of the four corners of the edifice, and at regular distances along the walls, which arose straight from the moat, are strong flanking towers of semi-octagonal or semi-circular shape, the chief apartments on the upper floor being lighted frequently by splendid oriel windows of great size. 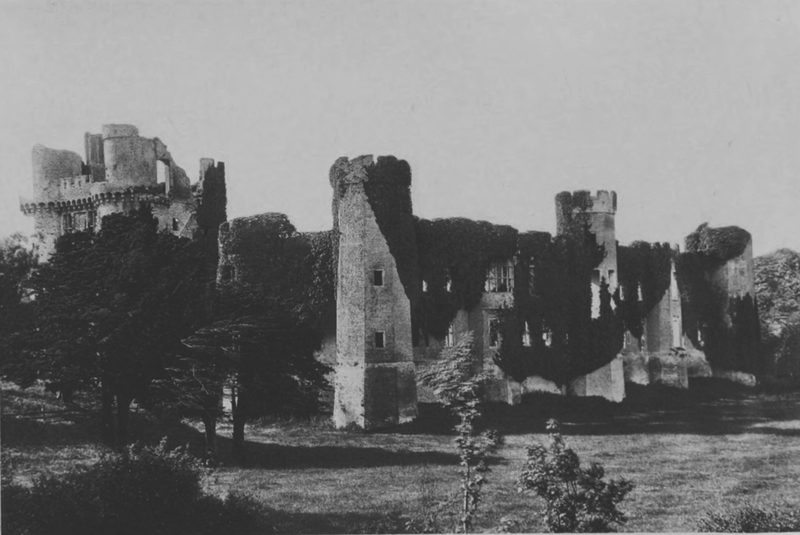 The building measures 206½ feet along the S. front, and 214½ from N. to S.
If we except Raglan, in Monmouthshire, there is no mediaeval castle in England with so imposing an entrance; the gateway, recessed in a lofty pointed arch, together with the square window of the draw¬bridge chamber, is supported on either side by a superb octagonal tower, loopholed on each facet, and changing into a round turret above, surmounted again by a lesser watch-turret. In front is a sunk panel bearing the device of the Flumes, the alant or wolf-dog. The whole building is of Flemish bricks, probably built also by Flemings imported by Sir Roger Fiennes, the Lord Treasurer of the Household, and it is curious that the other equally magnificent specimen of brickwork in England, Tattershall Castle, Lincolnshire, should have been built at the same time and of similar material by Ralph Lord Cromwell, who was Treasurer to the same king’s exchequer. The interior presents little more than a piteous maze of ruin, thanks to the vandalism of the Hare family, but an existing plan of the old structure enables us to trace out most of its arrangements. From the gateway was entered the green court, round each side of which ran a cloister ; behind this came the great hall, 54 feet by 28, and 28 feet high to the roof, at the back of it being the grand staircase ; thence a passage led to the postern tower and bridge at the centre of the N. front. 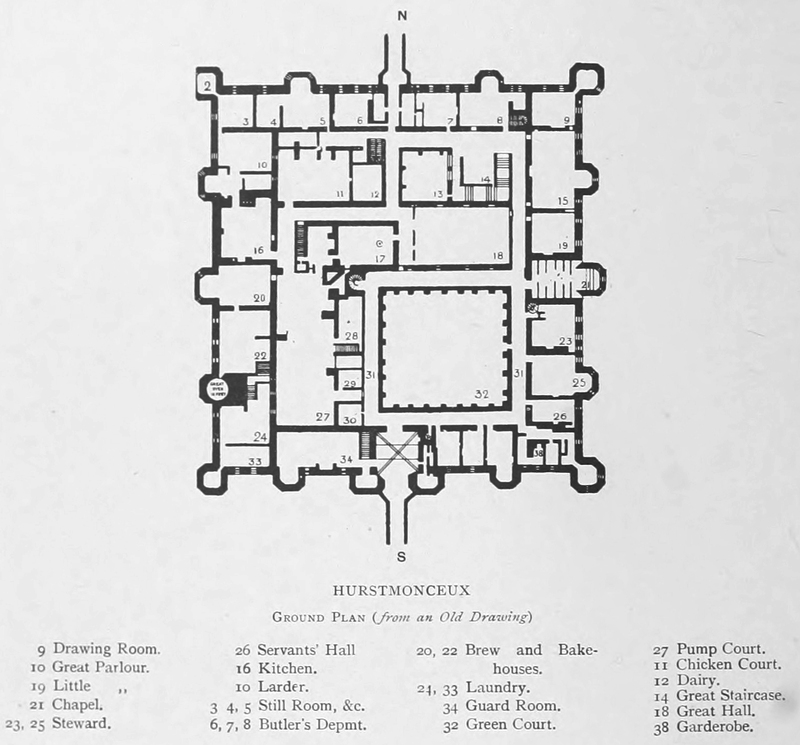 W. of the green court was the pump court, and next to the staircase was the butler’s pantry court, separated by a passage from the chicken court. Almost the whole of the ground floor was devoted to the servant’s offices, kitchen, bakehouse, brewhouse, laundry, &c., with a guard chamber on the W. side of the entrance. Seven staircases and four spiral stairs gave access to the other storey, whereon the private and state apartments occupied the N. and E. fronts, while six galleries gave means of communication to the inmates. The fine circular bay window next to the S.E. angle tower lighted the lady’s bower, in which it is said that Grace Naylor, the only child of the then owner, was, in 1727, starved to death gradually by her governess. The great drawing-room and adjoining rooms on this front were modernised and ornamented by Thomas, Earl of Sussex (temp. Charles II. ), and contained the fine carvings by Gibbons, spoken of by Walpole. 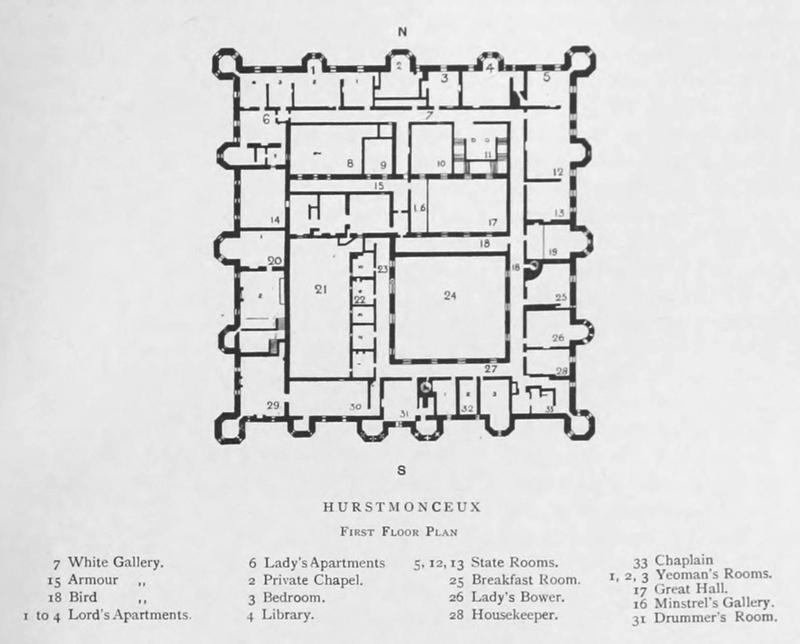 The chapel, on the centre of the E. front, the kitchen, and the hall occupied the height of both floors. The centre building was battlemented on top, and is described by Parker to mark the turning-point between military and domestic structures.